When 14 people partake in 5 events over 3 days you have to agree, “life is good”. Kicking off with a trip up Table Mountain; 14 gloomy faces staring up at cloud covered mountains, cloud cover so thick it looks like the mountains have been chopped in half. Feeling positive, Gavin insists that the view from the top would be perfect. Fortunately within minutes, the sun came out and burnt the clouds off. The views were spectacular. That eerie silence when 14 people suddenly realise they are taking it all in. Cape Town’s majestic views did us proud. A picnic at the amazing Maidens Cove did not disappoint. The Twelve Apostles and activity on Camps Bay Promenade brilliant. Next stop Cape Town’s famous Robben Island. The 45 min boat trip from the Waterfront brings with it a welcomed cool break from the heat. The expansiveness of our ocean as well as the magical views behind us, the boat trip seemed to go a lot faster than anticipated. As we near the island I am surprised at how green the vegetation is. The tour includes a visit to the Blue Stone Quarry, The Ou Tronk (the medium security prison that housed our famous Nelson Mandela for 3 weeks over his trial. The Zinc Tronk was built to house most of the prisoners, it had a small library and a clinic. Later this was used as a sports field and tennis court. This was demolished in the mid 70’s. The museum fascinating and the information given is outstanding. We stand outside Mandela’s cell which brings us all to a very quiet and introverted space. It’s difficult to comprehend how our president spent 27 years of his young adult life here in solitude. A recommended outing for foreigners and locals alike. If you haven’t been you must. With excitement and in trepidation, 14 people board the private vehicle which makes an early start to Gansbaai for some Shark Cage Diving. Not much chatting or banter to speak of, but I suspect that’s because it’s really early and everyone is already asleep as the bus pulls out. We arrive in Gansbaai and meet with Lara, The operations lady. She’s very organised and gives us a run down on what to expect. Not much humour in the safety briefing, but then I do tend to look for humour when I’m a little nervous. The boat takes off early. The private charter is well worth it, everyone knows everyone else on board and everyone can be quite vocal with their excitement and apprehension. The Dive is phenomenal with some brilliant sightings. As we are lowered into the water to a depth of around 3 meters, there are seven of us positioned in the cage. As the cage breaks the water we see a large Great White Shark coming towards us. I hold my breath. In fact I suspect I was holding my breath throughout the entire dive. Once I got used to the fact that I was safe and contained in the cage I started to enjoy myself and felt far more relaxed. 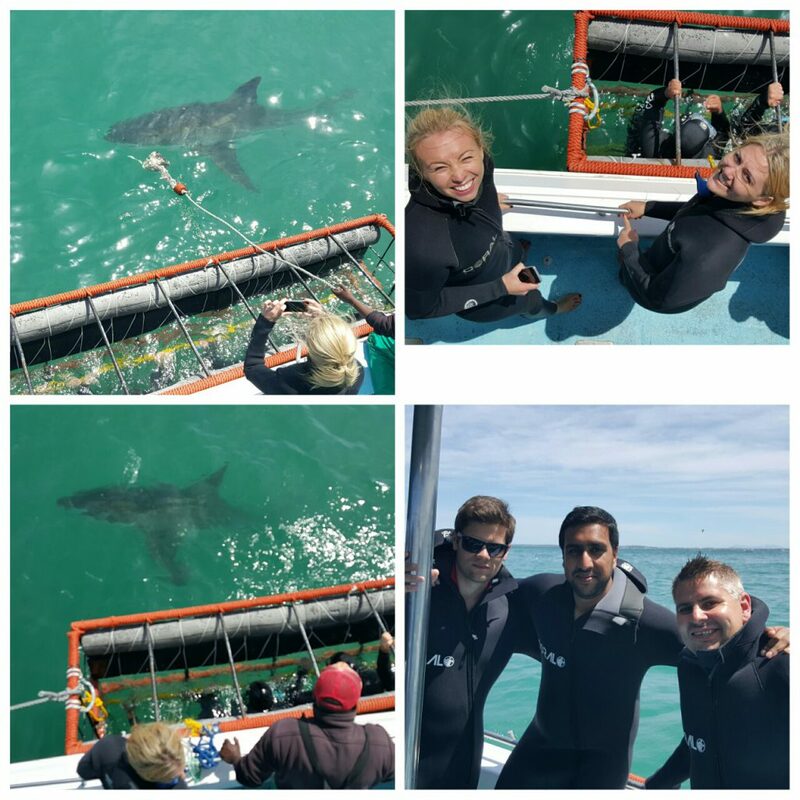 We all feel very fortunate to have had this brilliant experience and to have seen this awesome Apex Predators. To be amongst this magnificent species and to be up this close its mind blowing. I cannot stress enough how exhilarating it was. What an honour. To our amazement on our way back to the shore, we were lucky enough to witness a large Southern Right Whale breaching in the bay! This was an incredible experience. Don’t you just love Africa! We visit Fairview for cheese and wine tasting, La Petite Ferme for cellar tour, tasting and lunch and then a quick wine stop at Warwick Wine Estate on way back to town. 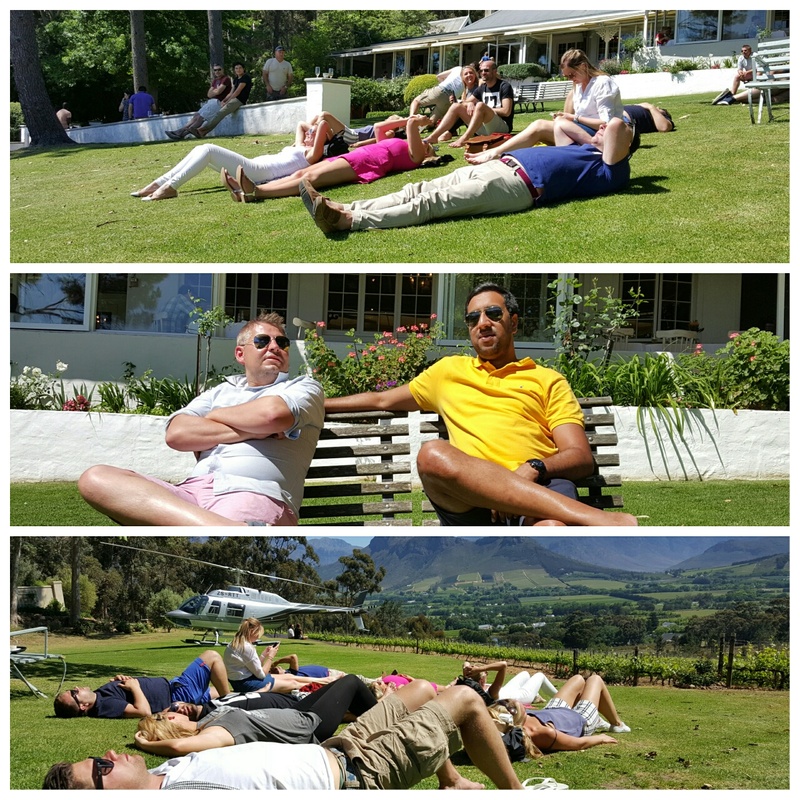 The treat of all treats, 3 great wine farms, 3 incredible wine tasting experiences, delicious lunch at La Petite Ferme and back just in time to watch the World Cup Rugby. This tour is definitely now top of my wine experiences. The Franschhoek valley is beautiful. Each time I am in this area I am reminded that this is definitely God’s country. It’s the start of spring and every single flower seems to be exploding. The lush green setting, the magnificent mountains and the fresh air make for an excellent area to taste some of the best wines in the world. This experience is so well managed, its educational and more importantly fun. 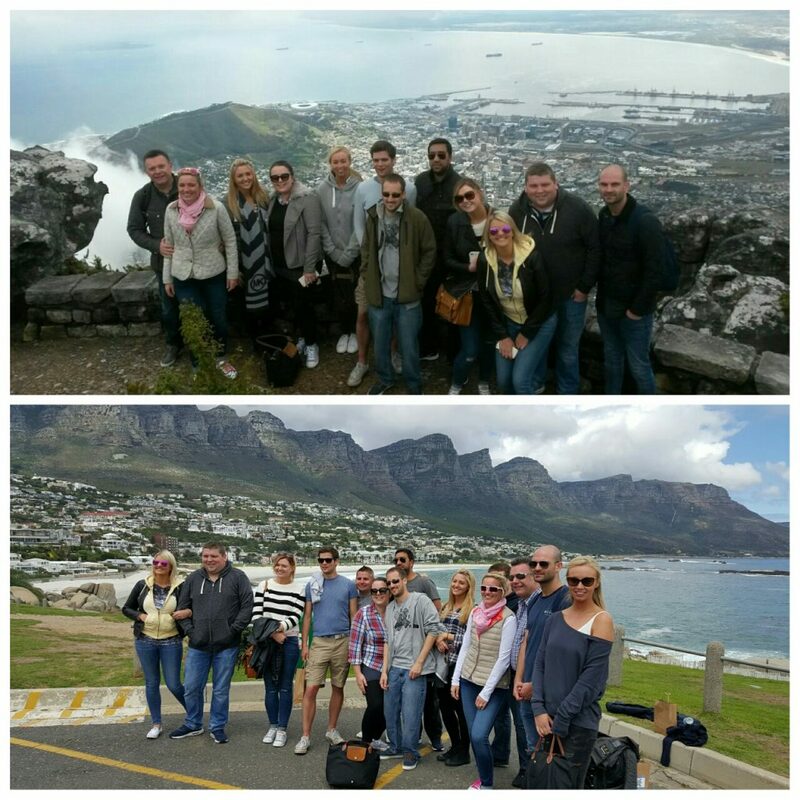 This is a definite must and the perfect ending for our UK visitors here in Cape Town on their incentive tour!